Very spacious house. Modern style, unique. Spacious living room and dining area. Big bedrooms. Two floors. 6 bedrooms, 5 bathrooms and baths. Huge terrace with landscaping and sitting area. 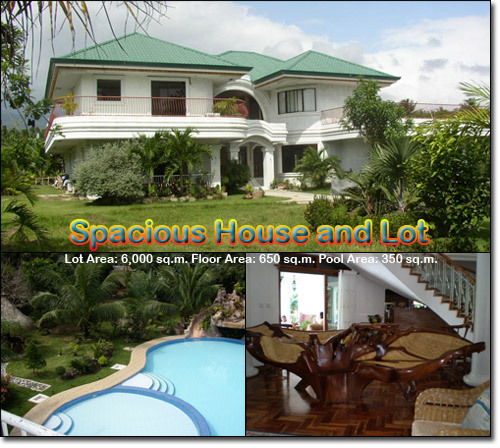 Big swimming pool with slide and waterfalls (area: 350 sq.m) located in very peaceful and quiet neighborhood. 15 min. from city , 20 min. from airport and 20 min. from beach area. Solid wooden doors. Mahogany wooden tile floors. Caretakers and helpers house with toilet. Located in very peaceful and quiet neighborhood. 15 min. from city , 20 min. from airport and 20 min. Land consists of several high quality bamboo cottages. Uniquely structured. Animal quarters with chicken, doves, pigs, turkeys, guinea fowl, ducks, etc. Beautifully landscaped garden with sitting areas. Evenings are cool and air-condition not always needed. NOTE: Price is subject to change without prior notice. We accept term payments. Closing expenses to be shared 50/50 by seller and buyer.